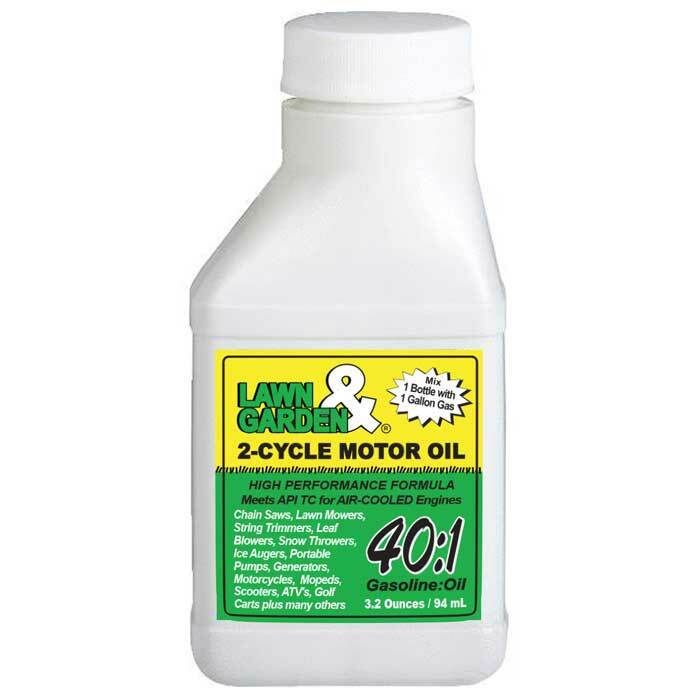 LAWN&GARDEN 2-Cycle Oil is a high performance formula, specially designed for AIR-COOLED 2-cycle engines. This oil promotes engine cleanliness and prolongs spark plug life. It also reduces carbon deposits and protects pistons and cylinders from scuffing and wear. A combination of select solvent refined base oils and special additives, carefully chosen and tested, to meet the lubrication requirements of pre-mix, two-stroke gasoline engines, operating in moderate to severe conditions. A special low ash additive package contains detergent dispersant, corrosion-oxidation inhibitors, and anti-wear additives to prevent ring sticking, piston varnish, and wear; while minimizing exhaust port deposits. Mix One (1) 3.2 Oz with One (1) Gallon of Gasoline for 40:1 mix ratio. Rated ISO-EGB, JASO FB, API TC. Recommended for use in chain saws, lawn mowers, snow throwers, string trimmers, leaf blowers, brush cutters, some snowmobiles, portable pumps and generators, high-performance motorcycles, mopeds and scooters, ATV’s, golf carts, and many other 2-cycle engines. CAUTION: The major cause of engine failure is improperly mixed fuel. Use care and your engine will last longer and run better. Where engine manufacturer require TC-W, TC-WII or TC-W3 oils, use SHIPMATE Outboard 2-Cycle Injector Oil.